I particularly like the caution against economizing (last paragraph). 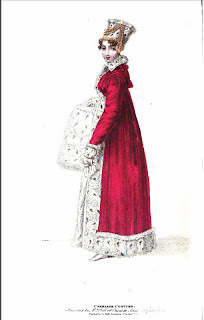 A velvet pelisse of a bright carmine red, superbly trimmed with ermine; the tops of the sleeves caught up à-la-Mancheron,* with rich military silk chain work, the colour of the pelisse. Russian hussar cap of ermine, ornamented with gold military chain. Limerick gloves and half-boots or shoes of kid, of a correspondent colour. The truly elegant and costly carriage costume of which we have given so beautiful a specimen in our Plate, while it confers the highest honour on the taste of the inventress, is likely to be a most prevailing out-door covering for the carriage amongst ladies of wealth and fashion, begin particularly adapted for the open barouche, as the manner in which it is made, with the warm hussar cap of light and valuable fur, shields the fair wearer from all the severity of the pinching frost or cutting north wind. For the close carriage nothing is reckoned more elegant than a pelisse of pearl grey velvet trimmed with ermine; and with this we would advise, as elegant and appropriate, a bonnet lately imported by Mrs. Bell, entitled the Netherland bonnet: its brim is of white satin, ornamented at the edge with carmine red velvet, of which latter material the whole crown is composed, and surmounted by a full plume of white feathers. For walking dresses black pelisses are much in requisition, and a velvet wrap of peculiar elegance forms a comfortable home costume when the weather is severe, and serves, with a tippet of ermine, as an outdoor covering when the weather is mild. But we would not wish the wealthy to economize too much lest the labours of the loom should fail, and the industrious artizan be disappointed in the improving of his talents. We rejoice to see that silks are becoming almost universal, and when the ladies at the theatre throw off their carricks** or wrapping cloaks, that their dresses underneath are generally of that material. *Mancheron. A cap like trimming at the top of sleeves often slashed; 1810 and after. **Carrick. A long loose cloak fashionable in 1817 and after. —Elisabeth McClellan, Historic dress in America, 1800-1870. My general observation: Uhh! So pretty! I love those scarlet pelisses and wraps. Look like the peers robes.